If your family has outgrown sedans and crossovers, then you need the 2016 Honda Odyssey minivan, which comes packed full of fun and features yet still offers enough space for your entire brood (and then some)! If you and your family need a van, get yourself over to Burns Honda in Marlton, NJ to try one on for size. Our showroom is conveniently located to serve families from Mount Laurel, Cherry Hill, Medford, and the New Jersey surrounding areas. 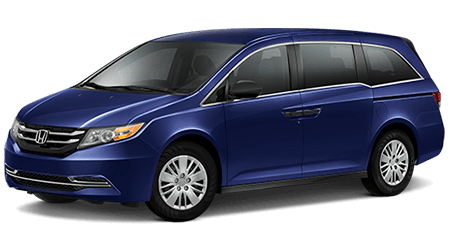 The 2016 Odyssey retains the proven powertrain combination of the 248hp 3.5-liter V6 and 6-speed automatic transmission driving the front wheels. Thanks to Honda’s brilliant engineering they can take this family van from 0-60 mph in under 8 seconds, and give you 28 mph in highway travel. Add the factory tow prep and you can even tow up to 3,500lbs with an Odyssey. The 2016 Odyssey adds a new SE trim to the LX, EX, EX-L, Touring, and Touring Elite trim levels. Every Odyssey is packed with family-friendly features, even the base LX has a rearview camera, full Bluetooth connectivity, HandsFreeLink with phone, SMS text and email functions, and sound system with CD player, and USB/auxiliary input jack. Of course, you also get power windows, locks and mirrors, keyless entry, AC, cruise control, and tilt and telescope steering. The new SE trim adds to that the popular rear seat entertainment video system, the HondaVac vacuum cleaner, satellite radio, and an 110v outlet. The EX trim, does not have those items, but does include HondaLink 7” touchscreen system with internet radio functions, power sliding doors, proximity key entry and ignition, tri-zone climate control, blind-spot camera, and alloy rims. Odyssey EX-L adds heated leather seats, sunroof, and power liftgate, plus lane departure and forward collision warnings. The EX-L with RES adds the rear seat video system, while the EX-L with Navi adds GPS navigation. Odyssey Touring gets both of those features, plus sporty 18” rims, parking sensors, and the 110v outlet. Top of the line is the Touring Elite with an even better rear seat video system featuring a widescreen 16” monitor and HondaVac in-car vacuum system. There is no reason to give up style or handling just to get a van capable of carrying the whole family, not with the 2016 Honda Odyssey. If you live in New Jersey near Voorhees or Evesham Township, and need a new van, come see the folks at Burns Honda in Marlton, NJ and you are sure to get a good deal.